Choosing the best mattress can be tricky. There’s a lot to think about: what type of mattress do you need? Which is the best mattress brand? How much should you spend? The good news is that the big 'challenger' brands do sales, voucher codes and offers on their mattresses all year round – and there are some amazing Easter deals on virtually all of the mattresses below. Our price comparison tool below is showing today’s lowest prices for each model, so you can sleep even easier knowing you bagged a bargain. We think the five-layer Simba Hybrid memory foam pocket spring mattress is still the best mattress you can buy. It offers a brilliant balance of comfort and support, with thousands of patented conical pocket springs, a “Simbatex” cooling layer, responsive memory foam and poly foam base. Pocket sprung: supports you with thousands of small springs inside their own fabric pockets. They adapt to your body shape, and isolate movement so you won’t feel your partner tossing and turning. Memory foam: made from mouldable material that responds to your temperature and weight, and adapts to your body as you sleep. Can be more expensive. Latex: breathable, springy material that’s exceptionally durable and resilient. Can be expensive. Hybrid: offers a combination of material – often with a pocket-sprung base and memory foam top layer – making them both responsive and supportive. Continuous and coil: made from a single looped wire, or from single springs fixed with one wire. These are cheaper and less likely to give a good night’s sleep. Bed in a box: this refers to a delivery method, in which mattresses are compressed, rolled or folded into a box for easy home delivery. They’re usually foam, or a memory foam and spring combination. Never, ever buy a mattress you haven’t tried. Bear in mind that a quick showroom test won’t guarantee a good night’s sleep. However, many online retailers now offer no-quibble, free 100-day trials, so it’s possible to test at your leisure. Before buying a mattress, make sure it’s the right size. Your mattress – like your bed – should be 10cm longer than the tallest person sleeping in it. It should also be wide enough for you and your partner to put your hands under your head without your elbows touching (or without touching the edge of the mattress if you’re not sharing). Next, do the hand test: lying down on your back, push your hand under the small of your back. If you can’t, the mattress is too soft; if the gap’s massive, it’s too hard. And if you have a partner, make sure they try it, too: what feels fine solo may be like a bouncy castle when your better half’s on board. Also check whether a prospective mattress needs turning. Many don’t these days, but if you’re looking at one that does, make sure it has handles at the sides. The Simba Hybrid claims to be the most advanced mattress in the world. Consisting of five layers – including a unique layer of up to 2,500 conical pocket springs, foam, responsive memory foam, a “Simbatex” cooling layer to reduce overheating, and a hypoallergenic outer cover – it promises to deliver a great night’s sleep, regardless of your body type or sleeping style. How? Well, it's all down to Simba's patented conical pocket springs. They pivot in their pockets to adapt to your body shape while you sleep, giving you full body support – it’s particularly good for side sleepers – and reducing motion transfer between sleepers, so you won’t notice your partner tossing and turning. Unlike other mattresses, this bed-in-a-box isn’t labelled by firmness: the manufacturer calls it “perfect” and says it suits every kind of firmness fan. And thousands of reviewers agree that this is the best mattress for the money. Scroll down the Simba site and you'll see stacks of happy sleepers, with the only real quibble being the lack of handles for rotating the mattress. In fact, the makers are so confident you'll love it, there’s a 100-day no-quibble trial: if you don’t like it, you can return it within that time for a full refund. You’ll find today’s lowest Simba Hybrid mattress prices below. Hit View All Deals to see more size and price options for the best mattress you can buy right now. The highest scoring mattress Which? has ever tested - and there's 35% off for Easter! The Emma Original mattress has a lot in common with the other bed-in-a-box mattresses in this best mattress guide. It's a mattress that comes in a box, with a human name that ends in an 'ah' sound, and a promotional photo shot in a contemporary apartment. 100-day no-quibble trial? Check. 10-year guarantee? Check. Multiple layers including foam? Check. The Emma Original's differentiator is that it's the highest scoring mattress Which? has ever tested. Comprising three layers of foam – 25mm of Airgocell foam on top to relieve pressure and aid ventilation; 20mm of memory foam for pressure relief and support; and a firm 195mm foam foundation – it's been designed to suits all types of sleeper. And online reviews certainly seem to suggest it does. The Emma Original's biggest competitors are Simba (number one in our guide) and Leesa (number eight). With pricing normally typical for this increasingly cut-throat market sector, choosing which mattress to go for is usually a tough choice. Except that right now the company is running a huge Easter sale that slashes a whopping 35 per cent off. And that's (rightly) going to swing it for a lot of people. Throw in that endorsement from Which? and there are some very compelling reasons to choose the Emma Original this spring. And the 100-day, love-it-or-return-it trial helps take much of the pain out of decision-making, too. A whopping 365-night trial and lifetime warranty differentiates the Nectar memory foam mattress from the numerous other bed-in-a-box brands. Its pricing and sizing are broadly in line with the more 'established' challenger mattress brands (Simba, Eve, Casper, Emma and so on), but Nectar gives you an entire year to decide whether it’s right for you – that's impressive. The company is also climate neutral: all emissions are offset by various global schemes, including an Amazon forest protection programme. Delivery works like a dream. Amazingly, even the enormous Nectar Super King model comes packaged in a very manageable box, and it’s light enough for one person to wrestle into position. Admittedly, it smells a bit at first – all of these memory foam mattresses do – but it soon settles down. Comfortable from the minute Nectar comes out of its minimal packaging, it offers a medium-to-firm support level that suits any type of bed and all kinds of sleepers. There's a bit of give in the top layer, which neatly moulds around the body, while a complicated supporting base layer adds the required firmness for a peaceful sleep. We're not sure how well the adaptive cooling cover top layer works (it's supposed to draw heat away from the body) but we can say the matching pillows – which use similar memory foam tech – are totally dreamy. Nectar is a great mattress, and extremely comfortable at that, while the 365-day money-back trial proves just how confident this company is that it’s created one of the best mattresses you can buy. Most mattress-in-a-box brands offer only a mere 100 nights. We recommend buying straight from Nectar, which promises “the best available price” at all times. We’ve curated today’s lowest prices below – hit View All Deals to see more size and price options. With celebrity backers, nearly 1,000 delighted Amazon reviews and several shelves full of awards, the Casper mattress changed the world of mattresses when it burst onto the scene. The majority of customers are delighted with its coolness, comfort and delivery in an impossibly small box. It’s billed as a medium-to-soft mattress that uses four distinct layers of support, and while there’s memory foam in there, it isn’t as simple as a sprung mattress with a thin layer of foam on top or an overly soft foam and latex combination: it’s soft as well as supportive, and it’s proven popular with people who have dodgy backs. Larger sizes can be expensive, and again there are no handles, but when you consider how many hours you’ll spend in bed (not to mention the potential joy of having less back pain) this mattress is not a lot of money for what you get. As with other bed-in-a-box options, the no-quibble trial period should guarantee you won't end up unhappy. The top layer does strike us as slightly softer than the Simba. Whether that's better or worse is subjective, but some literally 'heavier' sleepers may find they 'sink through' the soft top layer and are then supported almost entirely by the firmer lower layer. The good news is, you've got 100 days to decide if you prefer that sensation or not. We’ve found today’s lowest prices below – hit View All Deals to see more size and price options. Silentnight’s Eco Comfort Pocket 1200 is a cheaper pocket sprung mattress with a clever solution to the problem of firmness. Rather than deliver the same firmness across the whole mattress, it’s designed with different zones to ensure that the lumbar area of your back gets more support than your shoulders. That makes it particularly good for anyone whose back needs something firm but who’d rather not wake up with pins and needles everywhere else, and it also means your partner’s movements won’t impact your side of the bed. There are 1,200 pocket springs and a hypo-allergenic cover, and the 29cm depth is pretty luxurious for a mattress in this price range. There’s a five-year guarantee but remember to turn it frequently: pocket sprung mattresses need regular turning to keep their shape. We’ve curated today’s lowest Silentnight prices below – hit View All Deals to see more size and price options. Eve, like its fellow 'named-after-a-person-and-arrives-in-a-box' rivals, positions itself as Mattress 2.0: rather than make a whole bunch of different mattresses, its mission is to make a single one that’s ideal for everybody. The cove is polyester, with four centimetres of memory foam underneath and a 3cm cooling layer below that. The final layer is made from poly foam that’s strong enough to do yoga on, and that means it’s suitable for slatted or sprung beds, divans or hard floors. Reviews are polarised: the majority of customers absolutely love the Eve mattress and leave five-star reviews, but the people who aren’t happy really don’t like it at all. The two key complaints are the initial smell of the mattress, presumably due to the poly foam – although that's normal, and will go – and the hardness. While the mattress is marketed as for everybody, it’s on the firmer side of medium. We’ve read reviews of aches and pains disappearing though, and the company will collect it for free if you don’t like it after your 100-night trial. We’ve found today’s lowest prices below – hit View All Deals to see more size and price options. Sealy used to make some of the world’s worst adverts round our way, where a heavily accented woman tried to buy a Sealy bed and the salesman said no, they only had sensible beds. What larks! But it’s true that Sealy beds are far from silly. The Sealy Nostromo has seven zones with 1,400 pocket springs, tencel fibres, a latex comfort layer and a luxurious 29cm depth. And it’s both hypoallergenic and pleasantly cool, even in hot weather. Which? magazine made it a best buy, Allergy UK has given it their seal of approval and there’s a five-year warranty for peace of mind. Amazon tends to sell it with a decent discount on the RRP too, so it’s worth buying online rather than in a shop. We’ve found today’s lowest prices below – hit View All Deals to see more size and price options. If you're struggling to sleep at night both because of your social conscience and a lack of comfort, Leesa may be your dream mattress. That's because for every ten mattresses sold, it donates one to homeless shelters and women’s refuges. 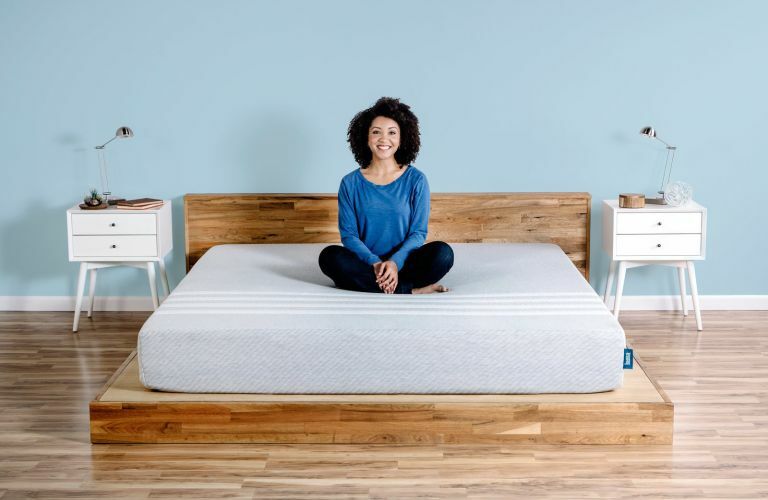 You won’t be sacrificing comfort for charity, though: the Leesa was designed to address the shortcomings of existing memory foam mattresses and uses three different kinds of foam to provide sufficient airflow and bounce. Consequently they're very popular and have good customer reviews plus awards from Which? magazine and the Good Housekeeping Institute for its comfort and quality. If you share with a partner their movements won’t bounce you out of bed, and the mattress does feel like something costing a lot more money. And yes, yet again there’s a 10-year warranty and a 100-night, no-quibble returns policy. We’ve found today’s lowest prices below – you can use the filter options to see more size and price options. Great for allergy sufferers, but is adding Aloe Vera a gimmick? The Dormeo Memory Plus is another one designed for allergy sufferers. To that end, it not only combines memory foam and Ecocell 3D foam to protect against asthma and mites, but it’s also infused with aloe vera extract. No? Us neither. At 18cm it’s thinner than many mattresses so it might not be ideal for heavier people or slatted bases, but if you like memory foam you’ll enjoy the 3cm of it, stitched immediately below the cover. Like all memory foam mattresses it’s important to rotate this one frequently to avoid semi-permanent dips from appearing, but if you look after it properly there’s a 15-year warranty to really guarantee the peace of mind that leads to a good night’s sleep. We’ve found that pocket sprung mattresses with a comfort layer offer a great combination of support and comfort, combining the best of pocket spring and memory foam mattresses in one bed. We’re particularly taken with Silentnight’s Geltex: in this mattress it’s a 4cm pillow top that adds softness to the support you get from 2,000 individual pocket springs. That gives it a total depth of 36cm, which is massive, and the Geltex layer stays cool and comfortable even in warm weather. Like other Silentnight Mirapocket mattresses, it’s zoned to deliver more support in the lumbar region than to the head and shoulders, and it’s very, very comfortable indeed – although it feels more medium than soft to us, so don’t expect it to feel like a fluffy cloud. Just make sure your sheets are big enough to fit it. Ikea is well known for its odd-sized beds, but in addition to European sizes, the Ikea Morgedal memory foam mattress comes in UK single, double and king size too. It’s a thick foam mattress in a polyester wrapping, and it’s best suited to a slatted bed base or mattress base. Don’t jump on it straight away: it’s delivered rolled up and needs three to four days to return to suitable flatness. Don’t expect lots of high-tech layers or cutting edge tech: Ikea’s mattress is exactly what you’d expect from a big lump of foam, comfortable and fairly immune to the movements of your partner. The foam can get a little damp if you tend to sweat a lot; if you do, a thick mattress protector is a good idea. There's a 90-day trial period, and it's won a gong from Which?, so it's something of a bargain, despite its distinct lack of bells, whistles and 'challenger brand' credentials. If you're on a tight budget, this is the best mattress you can buy. Need a recap? Here's a list of all the best mattresses in our guide, so you can easily compare prices and choose the right one for you.